Wholesale Personalized House Letter Openers, Custom Printed. Custom House Letter Openers Personalized in Bulk. Promotional, Inexpensive. Lowest prices in the USA and Canada. Bulk custom imprinted house letter opener, safe for children and adults: Ideal realtor gift. Our sturdy bulk personalized house shaped letter opener is solidly built with fingertip security in mind. A great place to put your advertising message! 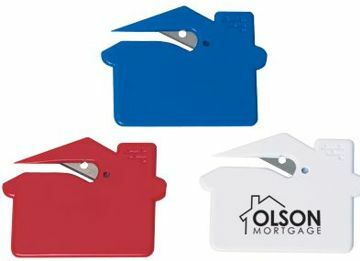 We also supply blank (not custom imprinted) house letter openers (min. 300pcs). Also available with rush 3-day delivery. Free artwork design. Budget Prices in the USA and Canada for wholesale personalized house letter openers. American clients pay no taxes. COLORS AVAILABLE: Red, Blue or White. PACKAGING: Cello Bag, 500 per carton @ 15 lbs.